The group of ten guests has finally departed, and I rush out from dish pit behind the kitchen to bus and reset the tables, the faucets of the sink still on. With a staff of just four at the bar I worked at, I was responsible for bussing, running food, washing dishes, and watching over the needs of the bartenders. My boss yells through the kitchen window to hurry up, but I’m already going as fast as I can in these cramped quarters. In this industry, working under pressure is expected and the pace is unrelenting. Yet, restaurant workers are some of the lowest paid in the economy, constituting a majority of minimum wage jobs. But with momentum building, a minimum wage increase may be on the horizon, a step towards addressing today’s growing economic inequality. The restaurant industry has quickly become one of the soaring sectors of the Bay Area economy. As San Francisco’s tech boom has reignited long-standing discontent over displacement and gentrification, it also has pushed demand in the service economy for low-wage workers, many of whom are people of color. Last year in Oakland, a nonprofit workers center called the Restaurant Opportunities Center (ROC) opened, bringing a much-needed resource for low-wage restaurant workers in the Bay Area. What began in New York City has expanded to ten branches across the country. Over the summer, I interned with ROC and, like many college graduates, I also took on a minimum wage restaurant job because of the slow job market in the nonprofit sector. There I learned of the struggles going on in the restaurant industry. 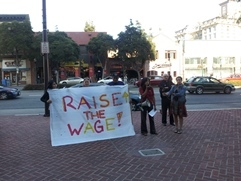 Last July, on the fourth anniversary of the last increase of the federal minimum wage, I joined fellow restaurant workers in downtown Berkeley to push city officials to support legislation to raise Berkeley’s minimum wage. At just $8 an hour, the city has lagged behind San Francisco and San Jose at increasing its minimum wage to above $10. The demonstration marched through Shattuck Avenue, and stopped briefly in front of a McDonald’s, one of the nation’s highest employers of minimum wage jobs. The fast food industry saw a series of one-day strikes last year as worker discontent continues to grow over vastly underpaid and unstable working conditions. One of ROC’s key projects has been the collection of data from surveys of restaurant workers and interviews. The findings have been published in reports called “Behind the Kitchen Door” in nine cities where ROC is located. The reports conclude that low-wages, little benefits, and no opportunities for upward mobility are standard in the restaurant industry. Workers are often forced to work sick and many cannot even afford to eat the food they spend all day making. With surveys still being conducted, the Bay Area’s report is expected to be completed by May. My experience surveying restaurant workers has revealed a consistent need for a living wage, and the voices of low-wage workers are undoubtedly being heard. California recently passed a bill to raise the minimum wage to $9 by mid 2014 and to $10 by 2016. President Obama has also announced his support for an increase off the federal minimum wage from $7.25 to $10.10. Locally, the demand for a $15 an hour minimum wage has seen increasing support from the left, and in San Francisco, it may become a reality. Even with such positive support for increasing the minimum wage, restaurant workers will not be certain to benefit. Something called a tip minimum wage has been existence since 1991, which separates workers who get tipped like front of house staff versus those in the back of house. The tip minimum wage currently stands at $2.13 an hour and has been rigorously defended by the National Restaurant Association. Proponents contend that tipped workers make up the difference through tips, and businesses should not be obligated to allow workers to make the full minimum wage and also receive tips. Currently, just California and six other states do not allow for a separate tip minimum wage. In Berkeley, the Berkeley Restaurant Alliance has been lobbying the upcoming vote by the Berkeley City Council to include a tip minimum wage, which would make it the first city in the state do so. Back in July, ROC along with other labor organizations spoke at the Labor Commission subcommittee meeting to demand that the minimum wage increase include tipped workers. Many workers depend on tips to supplement their already low wages, and the fact that tips vary week by week is hardly reassuring. The Labor Commission is set to continue its meetings this month, but it is unsure whether its recommendation to the City Council will include a tip minimum wage. Despite push back from the restaurant lobby, many businesses have taken it upon themselves to promote fair practices. ROC has been compiling a Diner’s Guide that locates restaurants that adhere to supporting a vibrant and healthy restaurant industry that treats its workers fairly. ROC has called for businesses to take this “high road” rather than continuing to undermine their workers. They believe that restaurant owners and workers will both benefit from higher wages and safer working conditions. The 2014 Diner’s Guide was released this past Wednesday.